And this time, it's not for stealing other people's intellectual property or supporting Southern California sweatshops where workers make 12 cents per garment sewn — it's for allegedly forcing store employees to labor off-the-clock and to work through mandated meal breaks. Five current and former employees of the bizarre, supposedly Christian-run business have filed a lawsuit in San Francisco seeking damages for labor abuses they say are systemic and widespread. The five, who have worked at several different Forever 21 stores, are also seeking to make their lawsuit a class action, which would allow every current and past employee of a California Forever 21 during the affected period to join in any settlement. (That may be difficult, given the Supreme Court struck down a class-action lawsuit involving female Wal-Mart employees last year and ruled that in future, the definition of a "class" must be much more narrowly tailored.) In 2010 — before that Supreme Court ruling — a similar class-action lawsuit over off-the-clock retail drudgery at Polo Ralph Lauren was settled for some $4 million. The five workers, one of whom began working at Forever 21 aged only 16, say that they were made to work through their scheduled (and legally mandated) breaks, and that when they finished their shifts, they couldn't leave upon clocking out. First, they had to wait to be put through a bag check by store security. Being treated as a potential thief is not uncommon in the retail industry, especially at larger chains, but if your employer is requiring you to remain on the premises, that time must be on the clock. If bag checks are company policy, bag checks need to happen on company time. The Polo Ralph Lauren lawsuit involved the same practice of off-the-clock bag checks. The Polo Ralph Lauren suit affected 6,700 California employees. 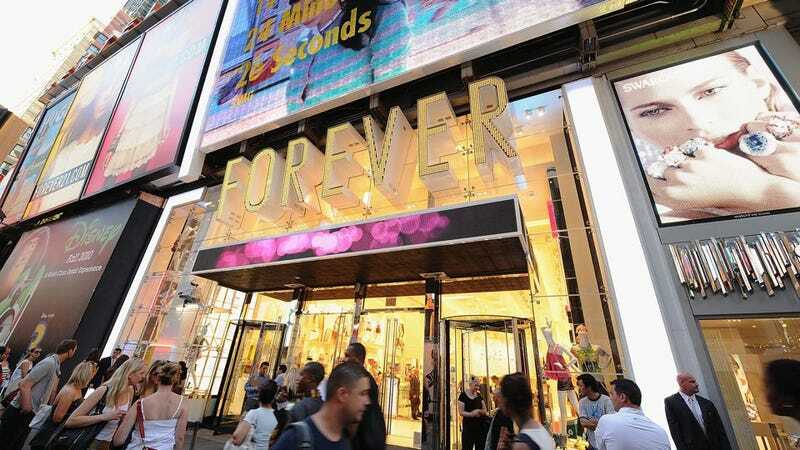 If the Forever 21 case is allowed to proceed as a class action, it could be even bigger. Forever 21 has been the subject of more than 50 lawsuits over its habit of manufacturing direct knock-offs of other designers' work; in each case, it has settled. In 2004, it also settled a lawsuit over its treatment of the garment workers who made those clothes. In that case, as the Los Angeles Times reported, workers alleged that they "were denied lawful wages and exposed to dangerous work conditions. They claimed they sewed, ironed or packed Forever 21 clothing six days a week, sometimes 12 hours a day, for far less than minimum wage." Sounds like conditions at Forever 21 might be almost as bad for workers on the retail side.